PHILADELPHIA (AP) — Construction crews working on an apartment building in Philadelphia’s historic district got a shock last month when their backhoes started hitting coffins and unearthing fully intact human remains. 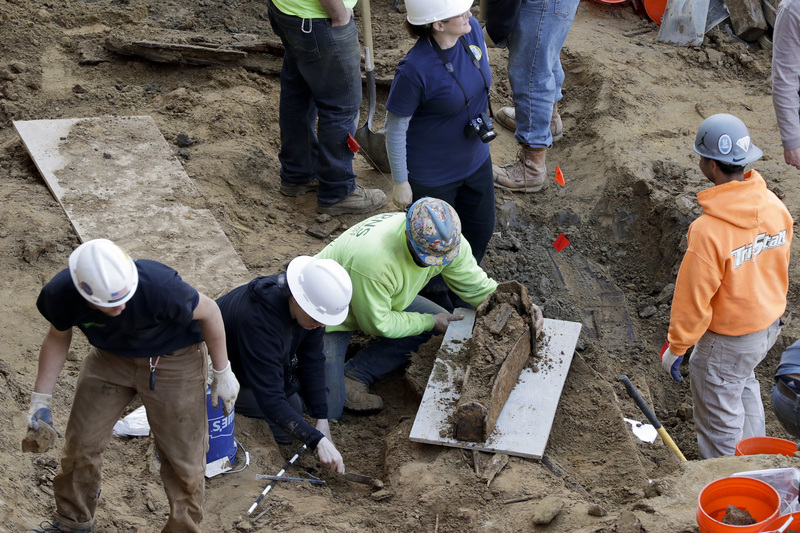 Now, forensic scientists and students at Rutgers University-Camden are working to recover as many of the 18th century remains as they can, to analyze them and find out who these people were, said Kimberlee Moran, an associate professor and director of forensics at the university. “We’re trying to help this forgotten group of individuals,” Moran said Thursday. The site near the Betsy Ross House was supposedly a decommissioned burial ground for the First Baptist Church, established in 1707. When the church moved to a larger location around 1860, all remains were to have been exhumed and re-interred at Mount Moriah Cemetery southwest of the city, according to historical documents. But as PMC Properties, the general contractor and owner of the site, started work on the 10-story, 116-unit apartment building, it became apparent not all of the remains were moved. In the fall, workers found a smattering of bones at the site. When they hit coffins, the company contacted archaeologists. As many as 60 individuals have been found since February. On Thursday, workers uncovered about two dozen intact coffins and were to continue working through the weekend, she said. The remains will be taken to a forensic-osteology lab at Rutgers-Camden, where they will be documented, cleaned and analyzed. There, researchers will be able to determine the gender, ethnicity and age at death, likely finishing up in the summer, Moran said. They hope to re-inter the bodies at Mount Moriah Cemetery. There are no state or city regulations on how to handle bones being unearthed unless it is at a government project, said Paul Steinke, executive director of the Preservation Alliance for Greater Philadelphia. Therefore, the company had no obligation to turn the area into an archaeological dig or halt construction. He said the excavation hasn’t significantly delayed construction and it should be completed on time. “We have our project to build, but we are trying to do the right thing here,” Stavin said.